Back in June 2008, a small group of Birmingham-based bloggers got together, and discussed all sorts of web-related things over coffee. One thing that came out was the idea of pulling together podcasts, focussed mainly on the creative industries happening in the region, and the vibrant music scene. Then some bright spark said, “Why not turn it into an on-line radio station as well…” and here we are, some short time later. The small group started their own blog, just to see who was interested in joining in, and the first meeting was set up. 14 people turned up, chatted, pushed ideas forwards, and suggested other people to join in. The 2nd meeting, 2 weeks later saw 28 people, the 3rd 31, and now (just 3+ months later) we have in excess of 50 members, a live radio studio, training & recording facilities, and a big kettle! Based at The Custard Factory, amongst our membership group we have musicians & bands, designers, producers, printers, photographers, performers, marketing consultants, artists, teachers, dj’s, video artists, web specialists, community mentors, finance specialists, administrators, bloggers, carpenters, sculptors, electricians, dancers, engineers, actors, writers, students, and many more. Rhubarb Radio CIC is now a constituted membership organisation that has been supported throughout its growth by Dynamics Community Arts, who specialise in developing and delivering cultural and regeneration initiatives across the West Midlands region. 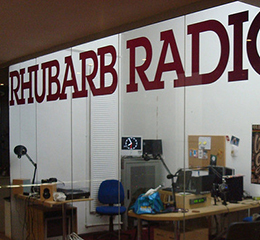 Based in Birmingham England, Rhubarb radio was a pioneer in community radio, it used to operate out of the old Custard factory media site up until November 2011. It produced a great Birmingham & West Midlands quality output of Local & International Music, community news and topics on Birmingham life and our proud history of Brum. However, sometime around 3rd or 4th November 2011 someone broke into or somehow entered the Rhubarb Radio Studio and removed a large amount of essential equipment. In short, the station was unable to broadcast at all. Due to different financial reasons the original owners were unable to save the station, the interim owners were not aware that there were historic problems and the presenters and support staff rallied round to try and save what they could but with all the equipment gone it was an impossible task. So the Rhubarb radio station went off air. Shortly after the station domain name lapsed. But by a quirk of fate some new entrepreneurial owners who really believed in what Rhubarb Radio stood for and what it meant to the Brum Music scene, managed to acquire it to ensure that it may have a fighting chance to re-launch if the right team could be re-assembled in the future. So as a first step here we are, over the coming weeks/months we intend to provide as many links as possible to the original presenters and their work, plus keep you up to date on what is happening next.